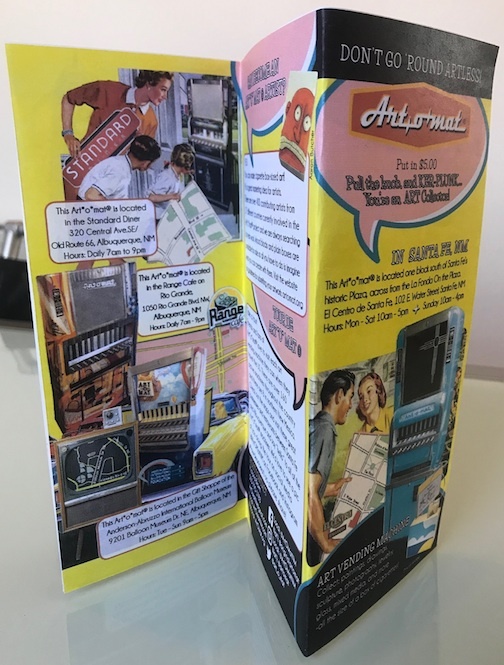 I've got a new brochure for 2019! 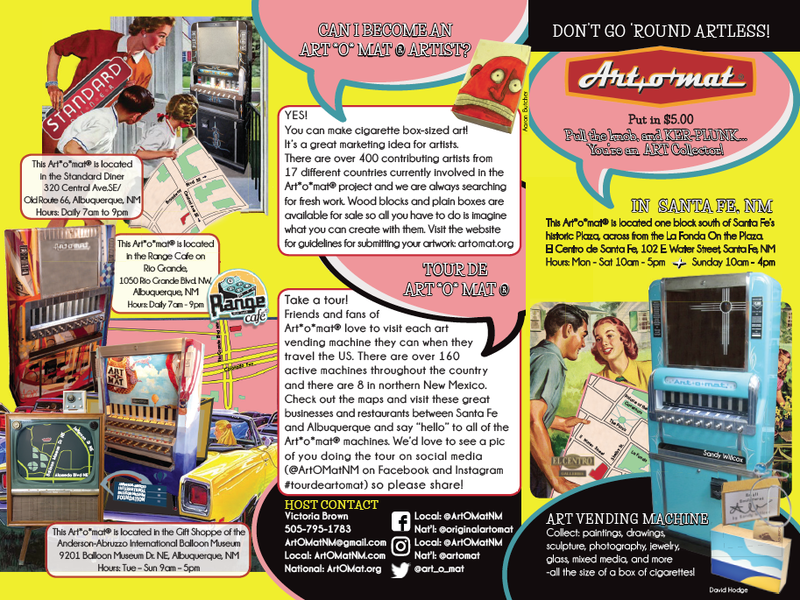 It has all EIGHT Art*o*mat® machines featured with one side for Santa Fe and one side for the Albuquerque area. Many thanks to Alex Hanna of Invisible City Designs for his creative eye and his never-ending patience (with me). You can find them in Brochure Distribution locations (restaurants, hotels, retail establishments, etc.) all over Santa Fe and next to all of my Art*o*mat® machines. Today is the day! 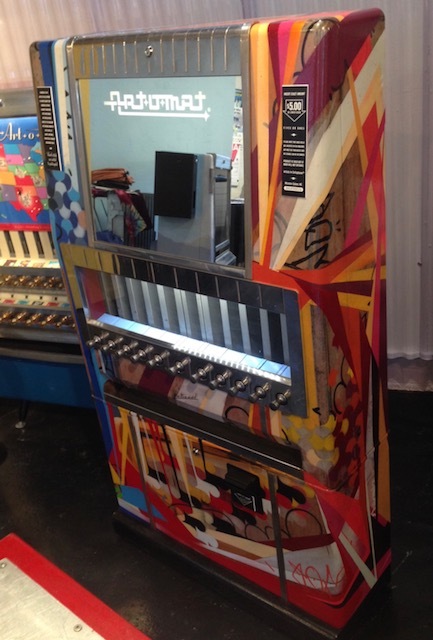 We finally got our EIGHTH Art*o*mat® machine installed in northern New Mexico! 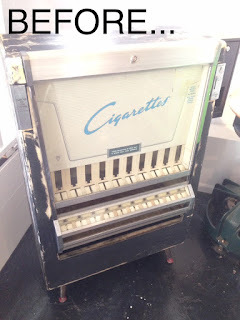 This gorgeous graffiti-ed vintage National brand cigarette machine has been placed near the foyer inside The Range Cafe On Rio Grande at 1050 Rio Grande Blvd NW in Albuquerque. Come on down to the Range Cafe On Rio Grande, have a bite (don't forget dessert), and be sure to visit the newest Art*o*mat® while you're there. 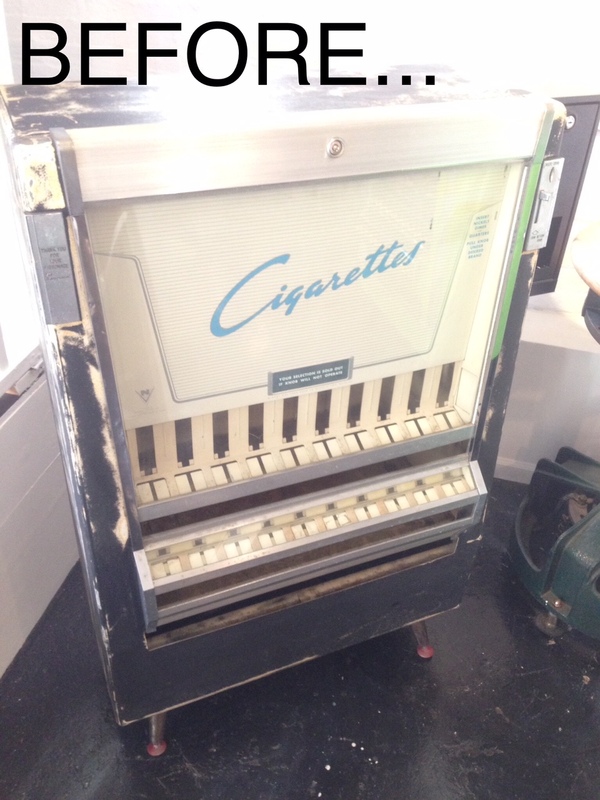 A noted graffiti artist that goes by the name Hieronymus is responsible for the striking paint job on this machine. 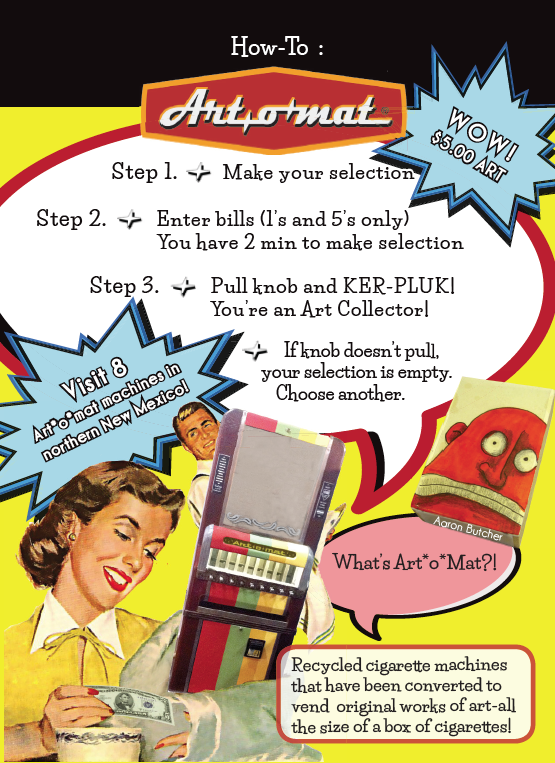 And you'll find great original works of art by Art*o*mat®'s "Artists In Cellophane" inside it -for only $5! Open daily 7am-9pm. 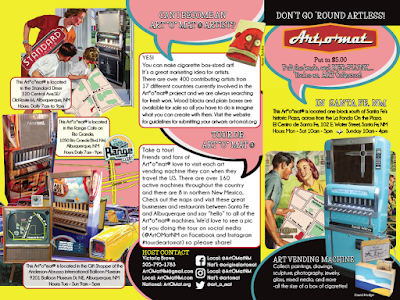 For other Art*o*mat® locations in northern NM click here. Special thank yous to Louis Correll, Laird Brown, Corky Brown, and the Range's Constance Banuelos. I appreciate you all so much! Range Cafe manager Constance Banuelos buys the first piece of art! Louis and Laird helped move it. Thanks! Like all Range Cafes there's plenty of art to see. 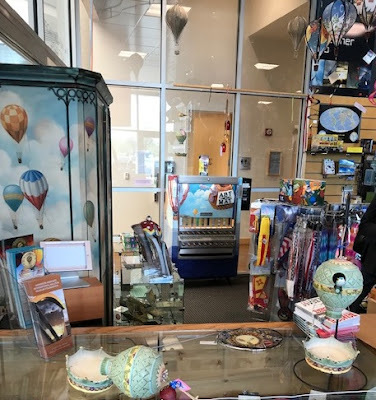 The Anderson-Abruzzo International Balloon Museum Foundation has millions of visitors through its doors for Albuquerque's famous Balloon Fiesta and now they've got one more. And "she'll" be staying a while! 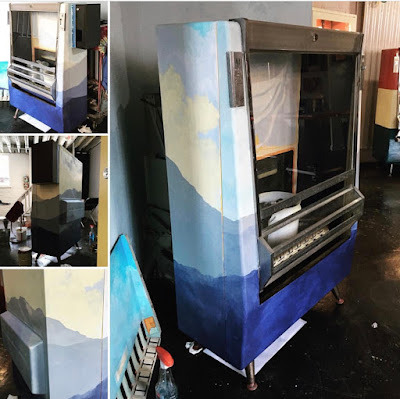 Meet the newest member of my ArtomatNM family, this gorgeous 20-column vintage cigarette machine-turned-art-vending-machine painted by North Carolina artist Jennifer O'Kelly. Beautiful hot air balloons festoon the front, sides, and backside of the machine against a backdrop of Albuquerque's skyline complete with Sandia Peak. I can't believe today is finally here! Installation Day at a dream venue! Madison Block, the Museum Foundation's Communications Manager, helps show how beautiful the Art*o*mat® is from the back. Artist Jennifer O'Kelly made a special effort to make it attractive from all angles. Art*o*mat® is at home in the Balloon Museum Gift Shoppe. "She" looks as if it's been there all along! Museum admission is FREE from 9 am to 1 pm on Sundays. Hieronymus has created a masterpiece! Greetings Art*o*mat Friends and Fans! I have some lovely news to share: This Art*o*mat® by painter, Hieronymus, is finished and on its way to New Mexico! Hieronymus (Hiero) is a graffiti artist and this is his interpretation of Art*o*mat® -what a colorful result! I cannot wait to see it in person. 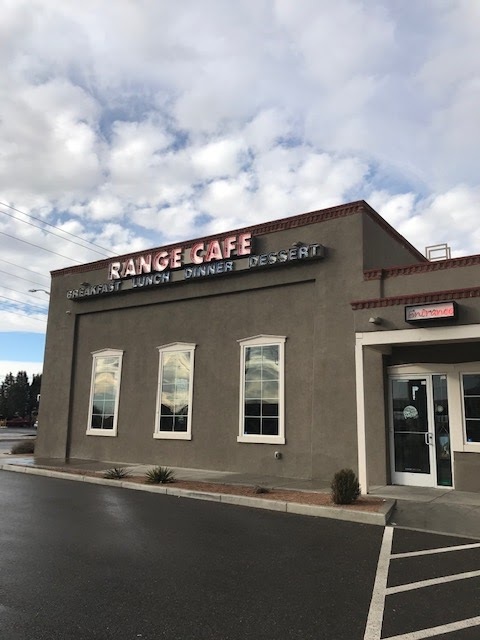 It will be installed in Albuquerque at the Range Cafe (Rio Grande location) at 1050 Rio Grande Blvd. NW soon. Stay tuned for details. Art*o*mat® in progress: painter Jennifer O'Kelley has captured ABQ's Sandia Peak in the background of this hot air balloon themed machine to be installed in the Anderson-Abruzzo International Balloon Museum. Also, painter Jennifer O'Kelly is hard at work on the 20 column Art*o*mat® that will be installed in the Anderson-Abruzzo International Balloon Museum in a few months' time. I'm really excited about how very Albuquerque this machine is going to be. You can already see the outline in the background of Sandia Peak -the mountain that frames the city and gives it its very special hot air ballooning phenomenon, The Albuquerque Box. And finally, ArtOMatNM now has its own local Facebook and Instagram in addition to artomat.org's national pages. Get social and share some pics, ideas, likes, bleeps, bloops, and interwebz stuff with me! Greetings and Happy Spring Art*o*mat® fans and friends! 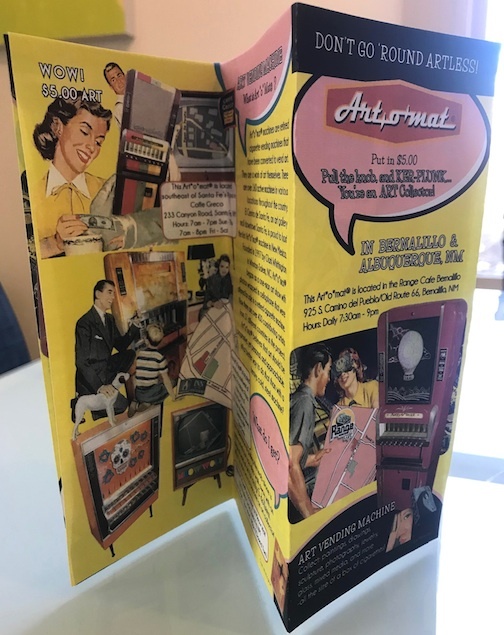 I have exciting news to share: In 2018 I will have two more "members" added to my "Family" of Art*o*mat® machines here in northern New Mexico. I am pleased to report that Albuquerque will be home to both of these machines: one will go to the Range Cafe (Rio Grande Blvd.) restaurant and the other (pictured above) will go to the Anderson-Abruzzo International Balloon Museum. Installation dates for the new machines are undetermined but they will be here in time for Balloon Fiesta (October 6-14). 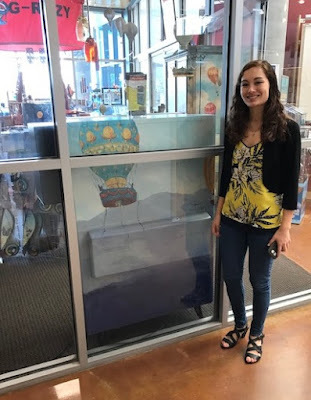 Artist Jennifer O'Kelly has begun work on the Art*o*mat® for the Balloon Museum and it will be covered with her whimsical hot air balloon paintings. The Art*o*mat® for the Range Cafe Rio Grande Blvd. location has been worked on by painter Hieronymus and he's created an amazing-looking Art*o*mat® in his graffiti style. Until then... Art*o*mat® is seeking NEW ARTISTS. 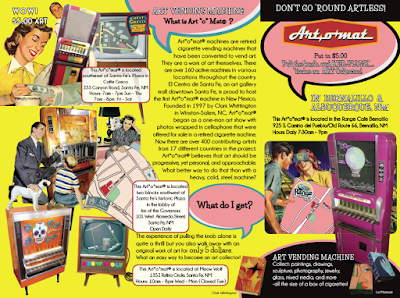 If you or someone you know is interested in creating art for these repurposed cigarette-machine-turned-mini-art-galleries please visit the Artists' Submission Page at artomat.org and learn how you can market your art by becoming an Art*o*mat® artist. Wishing you a Happy New Year and a great 2018! I've taken a few pieces from my latest shipment of Art*o*mat® art from Artists in Cellophane and a few from my permanent collection and arranged them in a 2018 sign on my flagstone porch in the gorgeous New Mexico winter sunshine. What better way to ring in the new year! 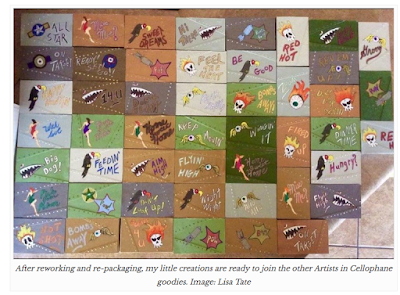 Thanks to all the artists** who make such wonderful works of pocket-sized art. 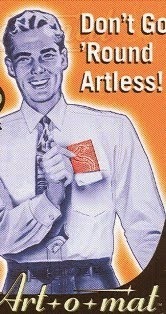 Until then: be safe, be happy, and most of all, "Don't Go 'Round Artless!" How thrilled was I to wake up today and find this cool article by an "Artist in Cellophane" (that's the name for all of the Art*o*mat® artists throughout the world)? Let's say really really thrilled. The El Paso artist, Lisa Tate, wrote the article, Why the Art-o-mat Vending Machine Is My Kind of Art Gallery, for GeekDad.com. 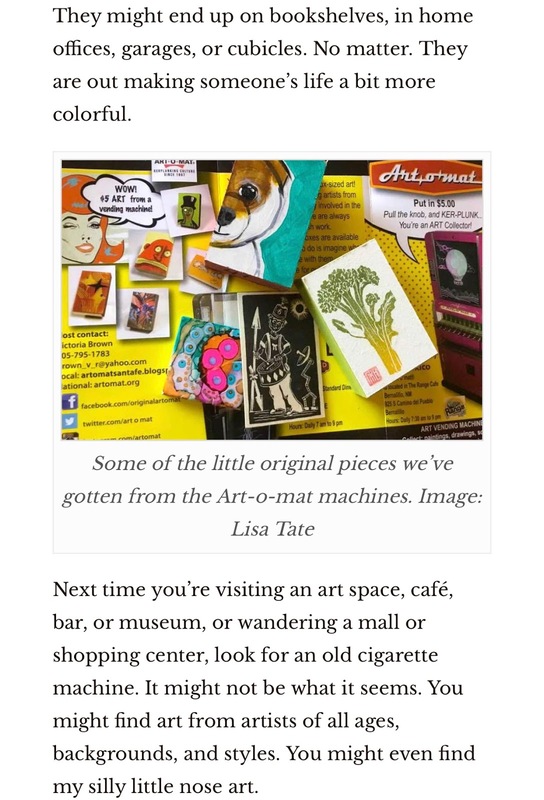 She writes about becoming an "Artist in Cellophane" and about how excited she was to find out that her art was sold in the machine inside the famous Meow Wolf right here in Santa Fe. I can't help but be excited that she used MY Art*o*mat® brochure as a backdrop for a photo displaying her collection of artwork she purchased. See her "nose cone" art below that can be and have been available in all 6 of my machines. Thank you so much, Lisa! Lisa Tate's paintings of vintage nose cone art -you know, the kind painted on fighter planes in WWII to intimidate and strike fear into the heart of the enemy! Paintings on wood blocks.